Nothing is worse than finding a blog I think I will really like, only to click “older” or “page 2” and have it be the homepage all over again. Half the time I wonder, did I actually click the link? Then I realize it’s an issue with their theme. Take a minute and check your site, if the pagination doesn’t work then it’s almost always a theme issue. Generally it’s a quick fix if the theme is meant to have pagination by installing a plugin or the issue might be your theme isn’t set up to work with pagination for whatever reason (for example a widgetized homepage), and should have the pagination links removed. If you have this issue, contact me and I will let you know if your theme is able to have pagination and if it does, I will point you in the right direction to get it working. If I have to open my email program, go back to your contact page, copy the email address, go BACK to my email program, open a new email, paste your email address in the to field THEN type my message and subject line… well it’s not going to happen (unless I am really desperate). I need a form to quickly get my message where it needs to go or a linked email address I can click to automatically open my email program with your information pre-filled out. Also, test your contact page to make sure every field works, that it doesn’t give the reader any error messages, and to make sure you receive it correctly. However you can actually customize the subject and body of the email! This is a great tip if you want to have an “email this post” option for WordPress! Notice how there is no email address in the mailto area, that’s because we want the reader to decide who to share the post with. I get confused when I follow someone on social media and they are married with kids but their about page says they are single and hope to get married and have kids one day. Or maybe they are celebrating their 40th birthday but their about page says they are 32 years old. Once every 6 months or so, go through and make sure your about page is up to date, especially if you use specifics like ages, family members, or location. So many times I’ll scroll all the way down to the footer to see a basic copyright (year and blog name) and… nothing else. No social media links or email subscribe box… nothing. It doesn’t need to be fancy but it’s always good to have a little bit of repetition. Prime real estate! Try to have in your footer your social media links, a search bar, email subscribe box, and of course your copyright information. A lot of the time a reader will wait until the very end to check out your social or subscribe to your newsletter, make it as easy as possible for them to do so! And make sure your copyright year or time-frame is up to date! An easy way to do it is via a simple PHP function you can place in your footer.php file. It automatically pulls in the current year. And you can easily turn it into a time-frame with any starting year that you need. I’m of the design belief that your font size should be at least 16px in size so everyone can easily read your content. I’ve come across so many blogs that are 12px or even 10px… and on top of it in a medium or light grey font. I will leave that site never to return because it will give me a massive headache! I am going to use the lyrics from one of my favorite songs, The Beatles – Revolution, in my examples below. Which one would be the most comfortable to read? Also remember that your overall content text color needs to be dark! It can be dark pink, dark purple… but it absolutely needs to be dark. On a light colored background as well. I also disagree that light text on a dark background is comfortable for larger amounts of content. A social media image? Sure! A blog post not so much. Again, we want our readers to enjoy coming to our blogs right? So making things easy to read without someone squinting or straining is a priority! This is also a really easy fix via CSS. You can contact me and I will increase your overall content font size at no cost. 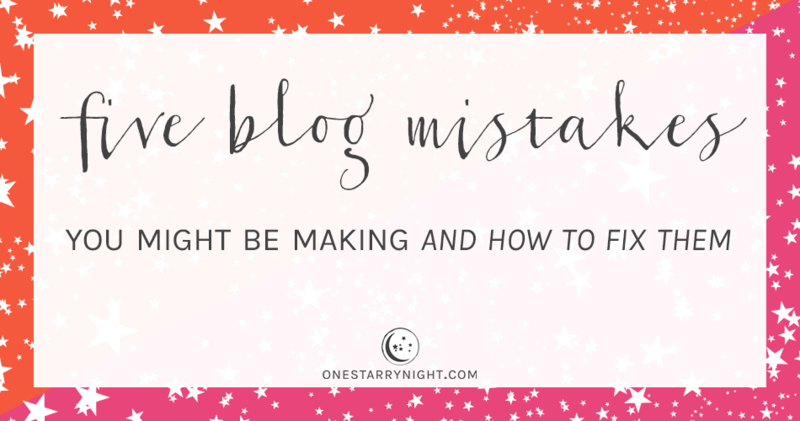 Let me know in the comments some blog mistakes you come across! I don’t think I’ve come across a blog with a like button for posts! I would love to see a few examples as this seems super cool to me! I found a “like” plugin and installed it, thank you for the suggestion!